Since having a little girl, sewing has taken on a whole new meaning! Yes I love to sew for my son, for myself, for my home, but really....GIRLS ARE WAY TO FUN! I purchased some great fabric online and wanted to make some fun spring and summer outfits. I knew going into it I'd have some trouble finding matching leggings, pants or diaper covers. You may remember that I made this great Spring Shirred Dress for my little one. I wanted matching pants. I knew I'd never find the right color to go with the fabric. But as you can see. I was able to dye my own and make it PERFECT!! The pictures don't do it justice! Seriously! First, you'll need your fabric, the fabric you intend to match it with and thread close to the color you want. You'll see I have a small piece of blue knit fabric. That was my "trial" piece. You can see it matches the "flower" fabric very nicely. This is also what I used to pick thread. POLYESTER THREAD DOES NOT DYE! So unless you want white thread showing through, make sure to pick a color thread close to your dye color. I purchased about a yard of this Rayon/Spanex knit fabric. It has stretch but is also very soft. Again, stay away from the Polyester if you want to dye the fabric. 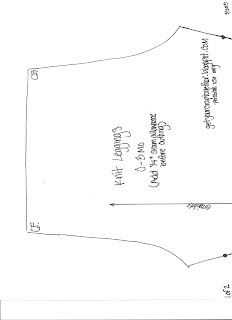 Now, pin down your pattern and cut. Lucky for you today....I have a FREE PATTERN for you to download. I know! Incredible! Most of the time you see people using their children's pants to compare and hope for the best. Well, my friends, not today! Today I have provided you with a FREE download of a pattern. What size you might ask? This is a 0-3 month pattern. But it could possibly fit up to a 6 month old. Depends on how your little one grows. My little one is 10lbs and she has plenty of room. You might just need to make them a little longer. Look how nice a double needle makes it look! And it is a zigzag on the back so it keeps that raw edge looking nice! Okay, do this for both leg pieces. Now pin your crotch seams together. If you don't know, those are the curved seams. Make sure you always pin knit fabrics, they tend to "shift" when sewn. Once the crotch seams are in open your fabric and put your two leg pieces together. You'll just sew one line from one hem to the other hem. Just follow the pins in my leggings above. Your almost done sewing!! Just a few more steps. See, they are already starting to look like pants. Now use that double needle again to make your casing at the top for your elastic. Make sure to leave about an inch opening so you can add your elastic. Thread your elastic through your casing. And sew your elastic together. Push it up inside your casing. Add a tag or just a bit of ribbon to mark your back and sew it shut. Tada!!! You know have some cute leggings. Using really really hot water and about 2 cap fulls of dye. Mix it good with your tongs. 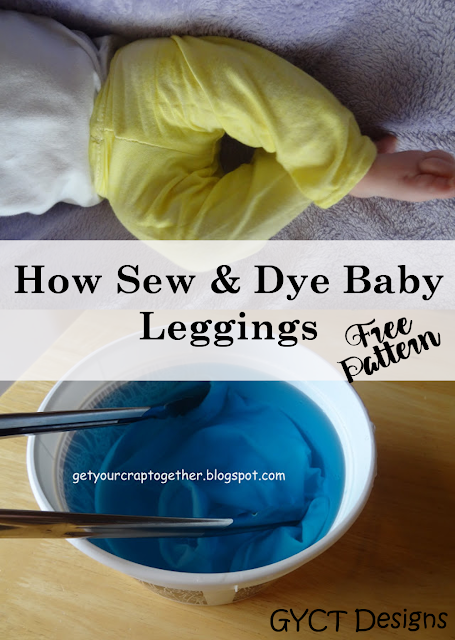 Make sure to get your leggings completely wet and then add them to your dye. Leave them in the dye for as long as you feel like. I left them in for about an hour. Then rinsed and washed them. They were still to light. So I made another batch of dye and let them sit another about 30 minutes. They came out really nicely. Now, if you look at them you'll see they seem a bit "baggy". This is because they should grow with your little one. They should fit from zero to six months. They are fairly long and leave space for diapers. Which is very nice. Dyeing is super fun! In fact, I plan to dye many more pairs of leggings. I can always find pink and purple. But not some of the other colors I'd like. So you might be seeing more pairs of leggings over the next little while. If you do plan to dye your own, you can always dye the fabric before you cut out your leggings or pattern. I just chose to dye the actual pants. This helped me not to waste my fabric. It is up to you though!